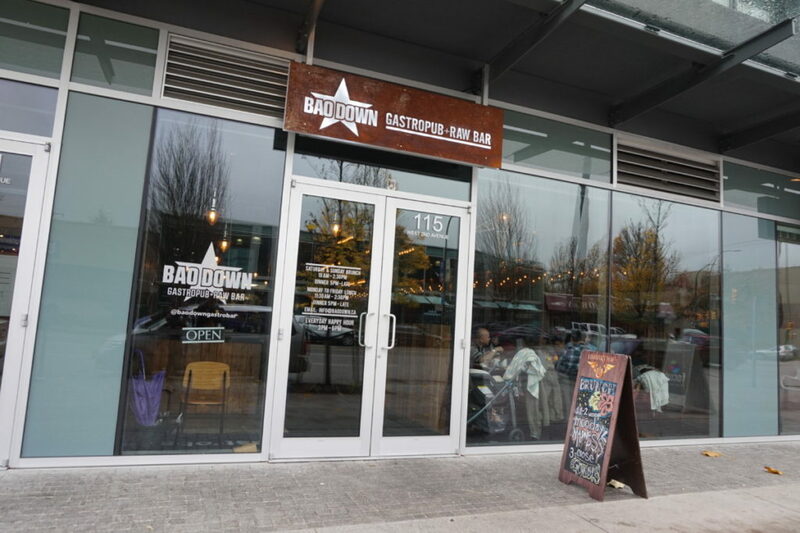 If I’m not mistaken, Bao Down Gastropub and Raw Bar is the only place that serves “Island Brunch” on the weekend. 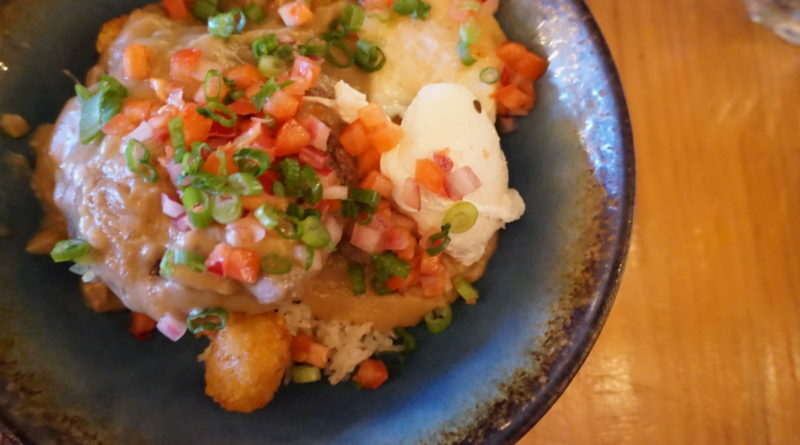 Their brunch dishes are inspired by local Hawaiian cuisine so you’ll get food like “Loco Moco”, “Maui Mowee”, and “Acai Bowls”. You might also find some random Filipino ingredients in there as well like garlic rice and longanisa (Filipino sausages) which I assume is there because the chef is Filipino. I could have hyped it up too much for myself because I was SOOOO excited to finally give it a try, only to be let down by the mediocre experience. 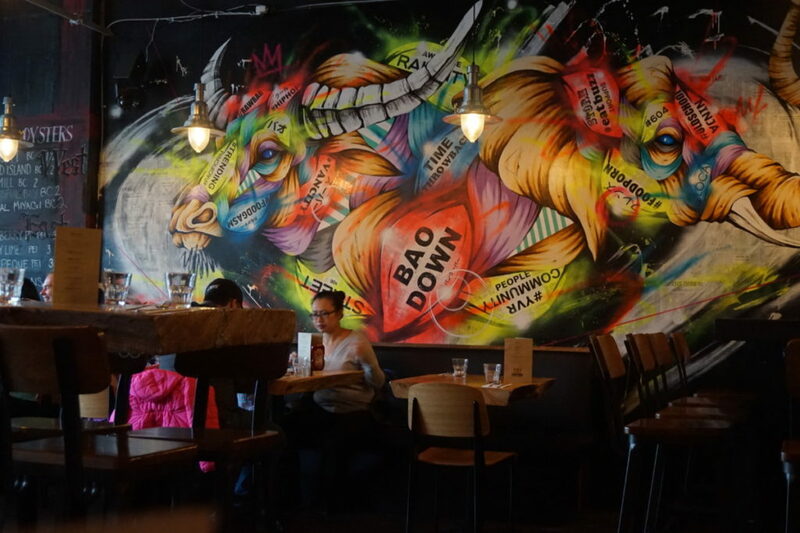 The interior is comfy, lively, and fully of personality as you can from the graffiti wall. The servers are all super friendly and ours was great as well. 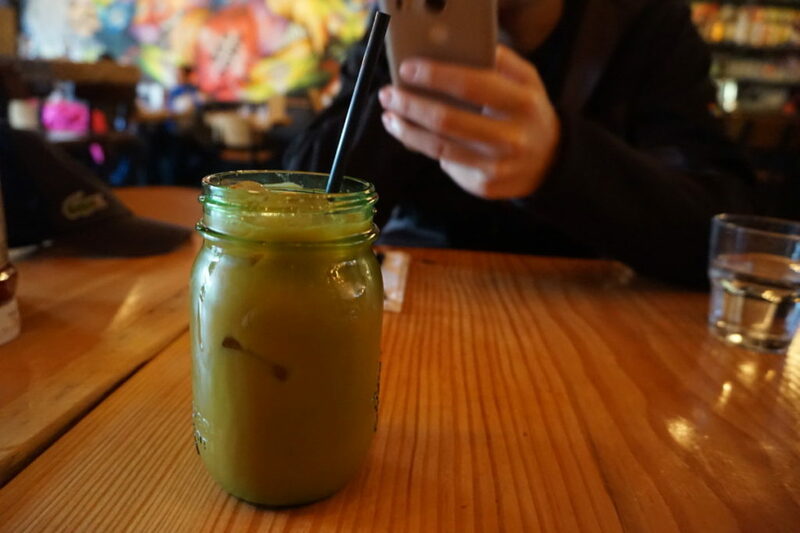 We started off with a Thai Milk Tea and I didn’t enjoy it because it was way too sweet. It also tasted a little bit diluted with not too much Ceylon tea flavour. 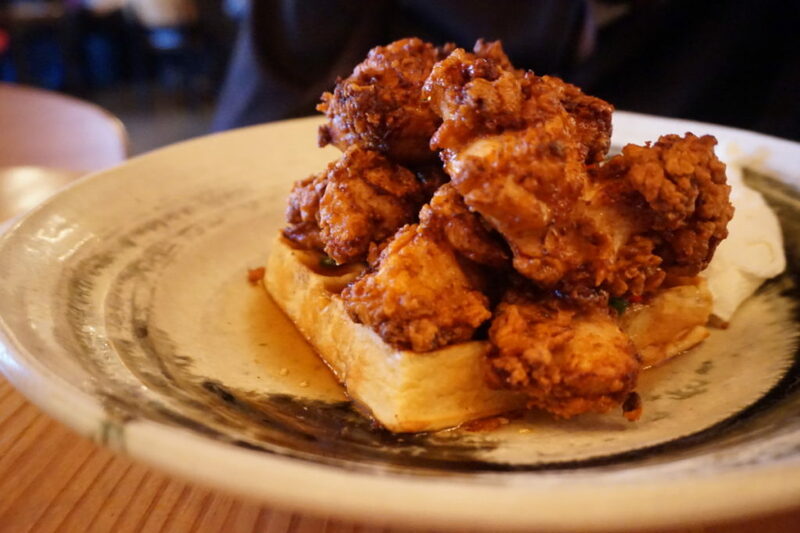 Meta Knight got The Hot Stuff ($18) with spicy fried chicken, crispy garlic, buttermilk waffle and eggs with Macademia syrup. All of these components sound like a slam dunk (how can it not?!) but Meta Knight didn’t like how the chicken was dry and how the waffle soaked up all of the syrup, making it super sweet. 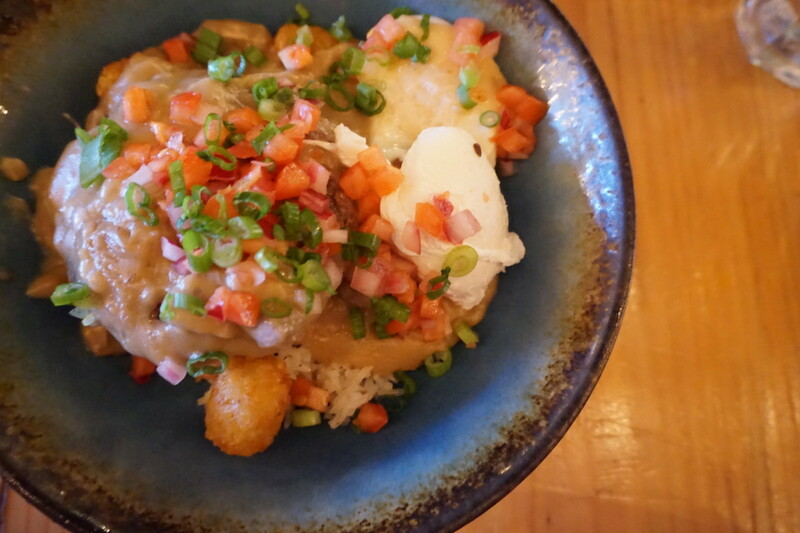 I on the other hand wanted to get something super Hawaiian as I remember eating Loco Moco ($16) back in Waikiki at Eggs N’ Things. 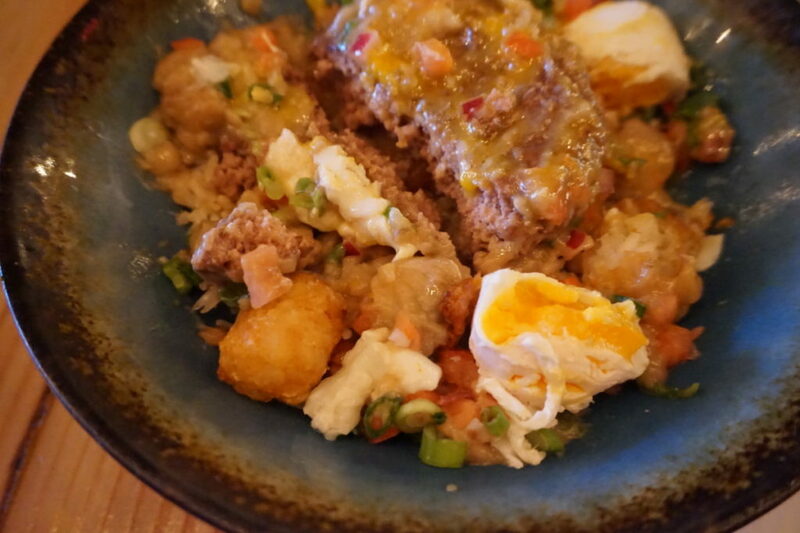 This Loco Moco had pressed AAA beef patty, beef and mushroom gravy, garlic steamed rice, 2 fried eggs, and hash browns. I’m going to sound super picky with this dish but I swear I’m usually very easy to please. It’s just, when the beef patty is dry, the egg is overcooked (you can tell by the pic), and the gravy is bland, it’s very hard to like this dish! Meta Knight and I were so sad leaving this restaurant because not only did we spend $50 on the meal (which isn’t cheap to us), we left unsatisfied and hungry for more.